When a paint company chooses a Color of the Year, it has a rainbow to choose from. But the question is relatively black or white: Select a polarizing, controversial hue (a la Greenery, Pantone’s stomach-churning Color of the Year for 2016), or pick a crowd-pleasing shade sure to wind up on walls across the country. The Color of the Year often foreshadows decor trends, but people are likely to apply a coat of it in their own home only if a color is approachable. Perhaps that’s why Behr Paint went with one of the most agreeable shades we’ve seen in a while. 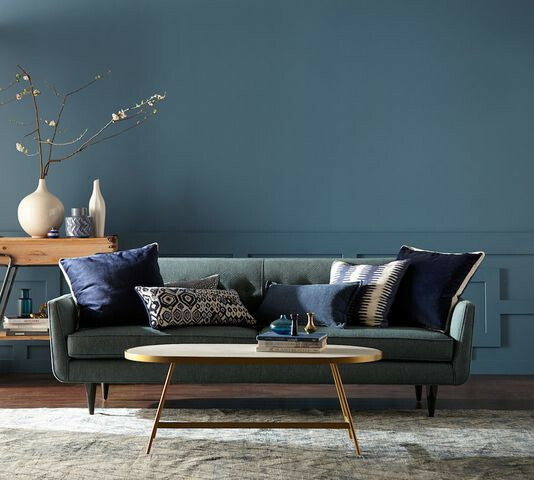 For its 2019 Color of the Year, the paint company presents Blueprint S470-5, which is a “strong and grounded, midrange blue that commands attention, but isn’t overwhelming,” says Erika Woelfel, vice president of color and creative services at Behr. It’s a cool blend of blue, gray, and green, which can suit a number of design styles and aesthetic sensibilities. A traditional craftsman home could rock Blueprint just as easily as a modern farmhouse. It’s a classic, simple, likable color. If we compared the color with an everyday object, we’d say it’s akin to your favorite pair of jeans. “Blue has a calming effect, so Blueprint is a perfect choice if you’re looking for a color that creates a feeling of comfort and positivity,” says Woelfel. 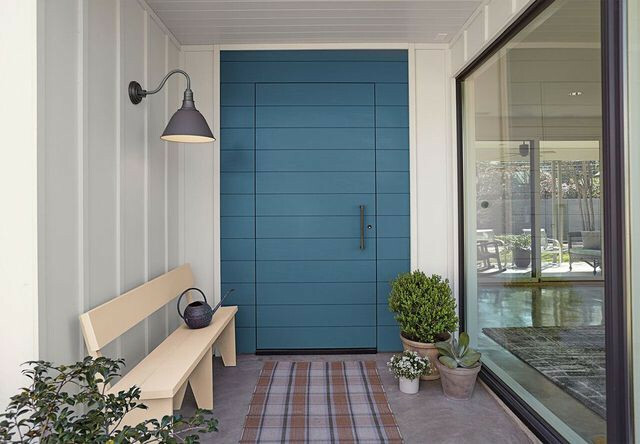 After Behr’s announcement, Blueprint was welcomed by design experts with open arms. Interior designer Ana Cummings says the shade Behr picked is of the moment: “It’s really on point with the market right now. I mean, how many blue kitchen islands are we seeing these days? Lots!” In fact, she’s doing a client’s entire TV room in a similar shade right now. Why not paint an entire wall in this universally appealing shade of blue? While Blueprint met with emphatically positive reviews, many of the designers we spoke with agreed it’s not a very daring shade. Cummings says this shade of blue isn’t a huge departure for folks willing to try something new. “It’s maybe one or two steps up the boldness ladder, not 10,” she says. If you’re risk-averse when it comes to decor, but itch for a splash of color in your home, Blueprint could strike just the right tone. A color this versatile will likely complement a variety of spaces, but the experts we spoke with see it working best on a front door, on an accent wall in a family room, or in a powder room. “I particularly love it in a bedroom setting because it’s such a calming color for when you are trying to wind down from the day,” Story says. If you’re hesitant to commit to four walls of blue, she suggests starting with the wall your headboard is touching. 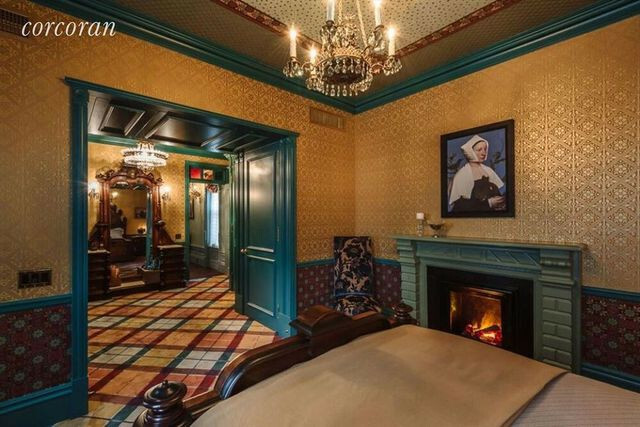 As a testament to the timelessness of this shade of blue, look no further than this recently renovated apartment for sale in New York City’s oldest co-op. The $3 million pad is creating a stir with its over-the-top interiors, but we spotted blue hues that look strikingly similar to Blueprint throughout the home. It seems this is one color that will stand the test of time.